Sonardyne International Ltd was founded in 1971 and rapidly became world leaders in underwater acoustics. Moreover, sonar imaging, wireless communications and inertial navigation technologies have materialised from Sonardyne’s research programmes. Sonardyne needed to create additional tank testing facilities as well as further space for the business including production and office areas. 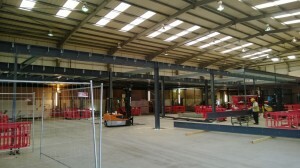 The heavy duty tanks mezzanine floor was designed with extended columns that ran up to 8.5m above the ground, which supported high level crane steelwork. 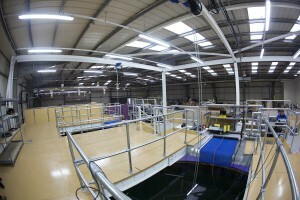 The purpose of this crane steelwork was to enable three mobile cranes to be located above the three large water tanks, therefore allowing Sonardyne’s personnel to lift equipment from the tank mezzanine level across and into and out of the water tanks.heavy duty mezzanine floor to accommodate three large watertanks beneath the structure. To ensure the testing could be carried out without any sound interference, HMF employed independent engineers to carry out frequency modelling of the structure. The tank mezzanine was fitted with 25mm thick marine grade plywood to ensure no moisture problems occurred with the decking. HMF fitted 1 hour fire resisting to the underside of the main mezzanine floor using two sheets of fireline board with smoke seals directly below the mezzanine floor. This was complimented with 1 hour column casings and a 1 hour fascia to achieve the 1 hour fire resisting. A plastic faced plasterboard suspended ceiling was installed below the mezzanine floor to enable the mechanical and electrical services to be contained within the service void, thereby giving an aesthetically pleasing work space below with good light reflectivity to production underneath. Access to the mezzanine was by six staircases and one ramp. These staircases were a combination of general access, utility escape and utility access to comply with the latest changes in Building Regulations in April 2013. The ramp was formed at a gentle gradient over 12m out of a sloping section of the mezzanine floor to enable ease of access to the existing offices located in the building. ½ hour partitioning was utilised to form protected stairwells and lobbies. A full height jumbo stud partition was built across the full width of the building up to the roof height, complete with direction head to segregate the new offices, meeting rooms and staff canteen from the production and storage areas. HMF constructed the meeting rooms, offices and canteen out of Apton demountable and relocatable partitioning. This system has pre-manufactured doors and windows and can be easily modified and reconfigured in the future to offer flexibility for Sonardyne. The partitioning was built up to a new insulated suspended ceiling by HMF which accommodated above the mechanical and electrical services. As Main Contractor, Hampshire Mezzanine Floors oversaw the implementation of Sonardyne’s mechanical and electrical specialists who provided modern efficient systems for heating, cooling and lighting the building. HMF constructed a glazed partition to enable the beautiful wooden water tanks to be viewed from production, up lit with lighting as a feature on the project. HMF carried out repairs to the building’s concrete slab and fitted both cementitious screens and epoxy hi-build paint systems to both the concrete slab and also the tank mezzanine. 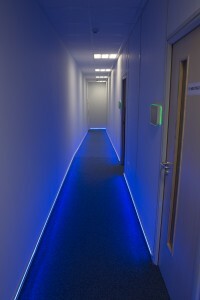 HMF also provided carpet tiles and heavy duty vinyl flooring to the offices and canteen. The substantial project which included all the mechanical, electrical and production equipment was completed in a very fast turnaround within six months. 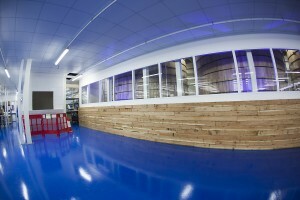 The completed installation looks not only impressive due to its size, but also due to the finishes chosen by Sonardyne.